There's not much contest lately so I'll just post something personal here :) Just to let you know my story with Egg. Love story perhaps? Haha! We knew each other since we were in form 6. (erm..8 years ago - guess how old am I? )Then we continued our tertiary education in Sabah (UMS) and that's when we started our love story until now! Well, it's not easy to maintain a relationship and there's always quarrels. Seriously, there's no couple who can avoid from disagreement of ideas. Perseverance is important.........WHAT AM I BABBLING ABOUT?! Sorry for being a little bit too "emotional" here. Well, there's an explanation for this! Did you realize that you don't really see Egg's writing in recent blog post? Previously, Egg did all the writings and I only did the cartoon stuff. But for this few weeks, I've been doing all the writings and drawing! Why?! 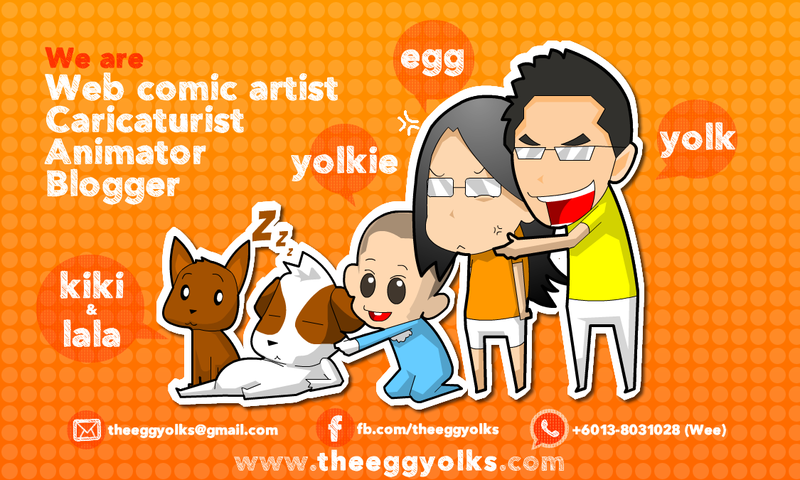 Because Egg went for her job training in KL for a month! I know to some of you out there, one month means nothing but for me, one month is like YEARS~~ So these few days, I've been digging up some old photos and flash that I've create all these years. Here's one of my favorite and it was done in year 2006. At that time, I secretly did this flash animation and send it to Egg as a gift! *please click the "half naked figure" to continue! 1. The drawing is lame! haha!